The image above was taken just after moving into our house. I always knew the grass was going to go, and in time it did. Rather quickly in fact. With the increased bio-diversity I noticed that birds didn’t just move through our garden, they moved into our garden. 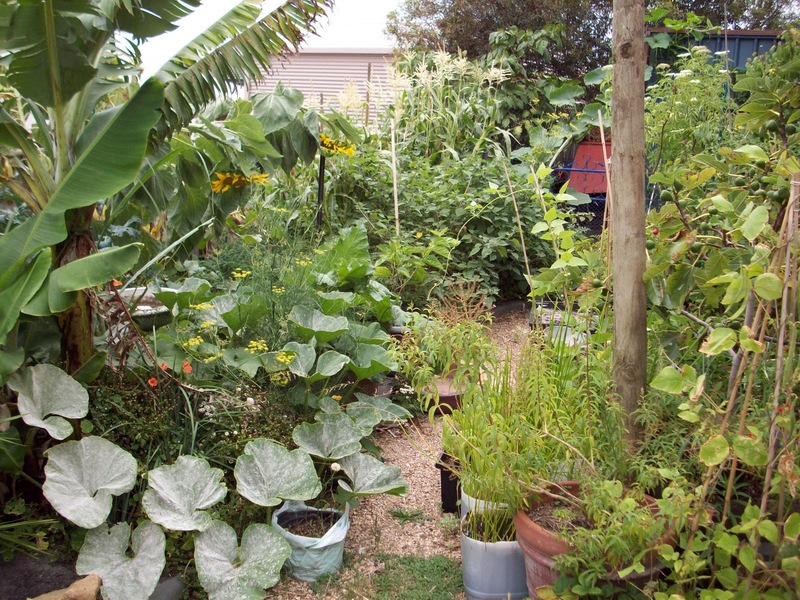 This is the garden around 2013/14. A magical playground for our two small boys who didn’t miss the grass one bit. It was sometimes frustrating having unripe fruit picked, but it was a unique learning experience each and every time they ventured into the backyard. This image above was from an early post titled Grass is for Parks. It is one of my favourite pictures of our garden taken in summer 2012 when our first son was only weeks young. It was a humid summer and the garden was just an oasis. Water chestnuts, bananas, squash, beans tomatoes, corn, berries, sweet potatoes…. fresh eggs…. This is the kind of little paradise I am hoping to transfer to the block in the image below. It is much larger in comparison, but still a modest size to manage the elements I wish to include, so as to provide for a growing family and continue my efforts at natural seed saving practices. The underlying process that we initially used to set up the first garden will be adopted to set up the next garden. The scale will be different, but there are more of us in the house now (increased food scraps) and we also have the addition of extra assistance in the form of chooks, rabbits, guinea pigs and quail. We only had guinea pigs early on when we set up the first garden. The chickens came much later. We will have the advantage of having them right from the start to get things going. My goal is to build soil rapidly and to document the process in more detail. As you may be able to see the basic structure is coastal sand.